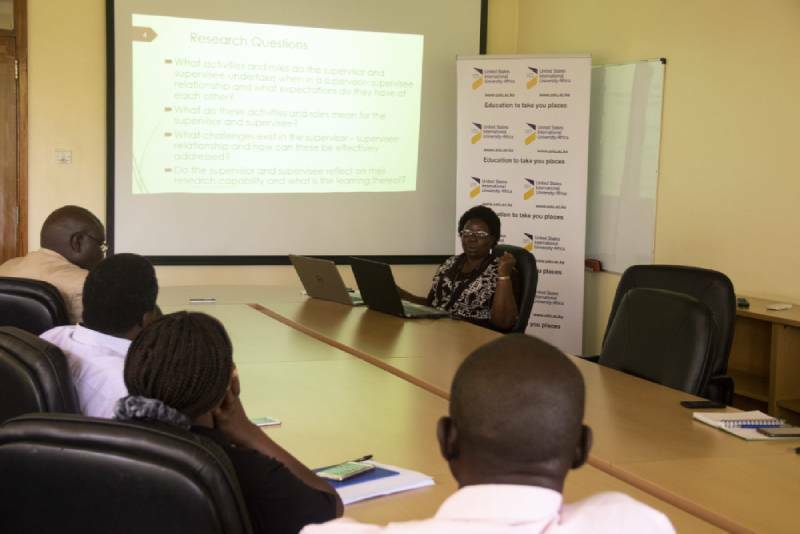 Prof. Damary Sikalieh, Professor of Management and Entrepreneurship Education at the Chandaria Business School presents her findings. PHOTO: TAIGU MUCHIRI. Research degree supervision is a bi-lateral process, a complex interaction between the supervisor and the student. This interaction plays a significant role in affecting the quality of the supervisory process and was designed to investigate the behaviors of supervisors and supervisees involved in the graduate research process and how these influence the supervisor-student relationship. It was necessary, to investigate this relationship in order to identify what activities supervisors and supervisees are delivering. This study was guided by specific research questions: What activities and roles do the supervisor and supervisee undertake when in a supervisor- supervisee relationship and what expectations do they have of each other? What do these activities and roles mean for the supervisor and supervisee? What challenges exist in the supervisor – supervisee relationship and how can these be effectively addressed? Do the supervisor and supervisee reflect on their research capability and what is the learning thereof? Using the phenomenological and the competing values frameworks, the proposed study adopted a mixed method design. Qualitative and quantitative data was collected from 22 senior faculty and a total of 150 graduate students spanning a variety of disciplines from 3 private and 2 public universities. The questionnaire and in-depth interviews were used for the process. The findings showed lack of and/or inadequate preparation of both the faculty and the students for the research process. There hardly existed harmonized guidelines. This cut across all the 5 universities irrespective of the discipline. While the majority of the students indicated that they had a good experience with their supervisors, a significant number cited delayed feedback, a lack of a proper strategy to guide the research process, failure to encourage students to present and publish their findings, as well as enable them make contact with other researchers and research networks. A majority of the students felt that they did not have a good experience as some of the things that hindered a good experience with their supervisors. However, the findings on the challenges encountered in the process of research supervision contradict these findings as they indicate that most of them agreed and strongly agreed with the availability of the supervisor, was friendly and approachable, provided guidance in the effective use of their time and listened to them. These findings were corroborated by the supervisors although a majority of them had challenges with students’ ability to find the relevant literature, referencing, critique the literature and the time demands for the supervision process. Both faculty and students were aware of their responsibilities and adhered to them and were aware of their expectations, roles and responsibilities of each other. It can be concluded that graduate students and their supervisors understand their relationship and know their roles and responsibilities. Once in the research process they encounter challenges which could be attributed to inadequate supervisor and student preparation. Another challenge supervisors encounter with their students is that of plagiarism. However, there is some kind of support for both the supervisors and students. The study recommends that research departments should establish research guidelines and also adequately prepare both the students and supervisors.